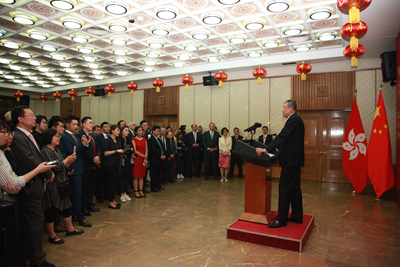 On June 26, Chinese Ambassador to the UK Liu Xiaoming and Madame Hu Pinghua held a reception at the Embassy to celebrate the 20th anniversary of the return of Hong Kong. Lord Heseltine, Former British Deputy Prime Minister, Sir Oliver Letwin, Former Minister for Government Policy in the Cabinet Office, Alex Pinfield, FCO Deputy Director of the Asia Pacific Department and Head of China Department, Kitack Lim, Secretary-General of International Maritime Organization, Stephan Perry, Chairman of 48 Group Club, Priscilla To, Director-General of Hong Kong Economic and Trade Office in London, and representatives of British government and parliament joined more than 200 other guests from the scientific and technological, educational, cultural, media, and academic communities, the diplomatic corps in London, overseas Chinese and representatives of Chinese institutions in the UK at the reception. Ambassador Liu delivered a speech and spoke highly of the historic significance of Hong Kong's return, pointing out that it marks the beginning of a new journey towards the great renewal of the Chinese nation, a new phase of prosperity and development in Hong Kong, a major innovation in terms of social and political system, a fine example of peaceful resolution of international disputes, an excellent example of addressing historical issues between states, and a contribution to world peace, development and progress. 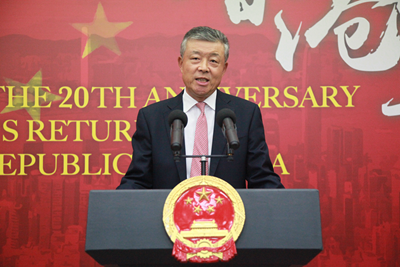 Ambassador Liu stressed that in the past twenty years since Hong Kong's return, Hong Kong has maintained steady and robust growth, built up closer ties with the motherland and set out to embrace a future that is brighter than ever before. The success of Hong Kong means that "one country, two systems" is a good policy that will not change. As President Xi Jinping said, "Whatever difficulties and challenges there are, our confidence and determination for the 'one country, two systems' policy remains unchanged, and our confidence and determination in implementing this policy remain unchanged." However, "One country, two systems" is an undertaking untried before, so there is no precedent to follow. And there will inevitably be all sorts of problems on the way ahead. But any problems that will emerge are "growing pains" on the way forward. Through trial and exploration, the policy will continue to be improved and become mature. Ambassador Liu noted that in the new era, China needs to stay committed to the "one country, two systems" policy to maintain Hong Kong's prosperity and stability in the long run and enhance Hong Kong's role as a bridge linking China and the UK while advancing bilateral ties in the "Golden Era". He listed three key points: "First, we must be true to our commitment and strictly follow through 'one country, two systems'. The fundamental purpose of the policy is to uphold national sovereignty, security and development interests and to maintain prosperity and stability in Hong Kong. We must stay true to our commitment, which means we must apply 'one country, two systems' comprehensively and accurately and always make sure that this policy is not misinterpreted or misimplemented. Second, we must maintain confidence and seize the opportunities to build a better future for Hong Kong. We must deepen cooperation between China and the UK and between Hong Kong and Britain, making sure that all sides will benefit. Third, we must hold our bottom line and firmly oppose the so-called 'Hong Kong independence'. Hong Kong is an integral part of China. There is no way out for the so-called 'Independence', which will bring about nothing but harm and hazard. And the bottom line that we must hold is to firmly oppose any 'Independence' activities in whatever form." Ambassador Liu emphasized that the Chinese Government supports Hong Kong's ties and cooperation with the world, but firmly opposes any interference in Hong Kong affairs by any foreign country under any excuse. He expressed the hope that all sectors in Britain will respect the facts of Hong Kong's return to China and China's sovereignty over Hong Kong, see the "one country, two systems" policy in its totality, and handle Hong Kong-related issues appropriately. "By recognizing and respecting the above, we will continue to make Hong Kong a positive factor between China and Britain, and ensure that Hong Kong will continue to contribute positive energy to the 'Golden Era' of China-UK relations," said the Ambassador. 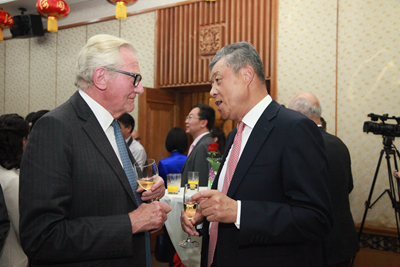 Guests at the reception said that Ambassador Liu's speech was "powerful", enlightening, and exciting. Calling the "one country, two systems" policy a huge success, they hailed Hong Kong"s remarkable achievements in the past twenty years since its return, its enormous vitality and bright prospects. They also wished Hong Kong a better future! 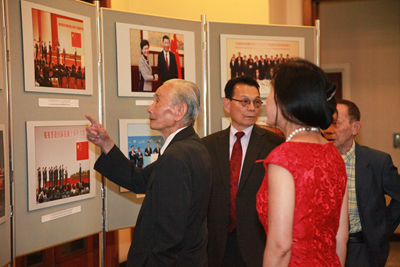 An photo exhibition was held at the reception to mark the 20th anniversary of the return of Hong Kong.